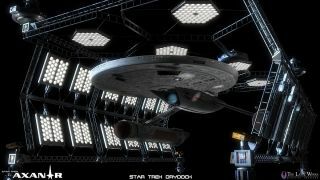 Concept art for "Star Trek: Prelude to Axanar" depicts a Federation starship in dry dock. A crew of "Star Trek" fans is taking the beloved franchise where it's never been before: For a fraction of the cost of a Hollywood film, they plan to create a feature-length production funded by crowdsourcing. The project, called "Star Trek: Axanar", aims to raise $250,000 in 32 days and officially launched Thursday (July 9) on the crowdsourcing website Indiegogo. Funds began rolling in prior to the release of an official media announcement, and the project has already raised more than 65 percent of its goal as of this afternoon (July 10). "For you, the 'Star Trek' fan, Axanar is a return to the type of 'Star Trek' we all grew up on, with a hopeful future where mankind works with other races to explore the stars, via storytelling that is positive and teaches us about ourselves," the new Indiegogo page for the film stated. The story follows the exploits of Garth of Izar, a Starfleet captain mentioned in the "Star Trek: The Original Series" episode "Whom Gods Destroy." The adventures of Garth take place about 21 years before Captain James T. Kirk's first "Star Trek" episode, "Where No Man Has Gone Before." The project's creators, led by executive producer Alec Peters, now plan to break up the film into four episodes costing approximately $250,000 each. According to the crowdsourcing page, the project must raise an additional $80,000 per episode (making the total fundraising budget about $1.32 million) to cover the cost of using Indiegogo (the company takes a cut from projects funded on its site), as well as "ongoing studio costs" and "payment processing." The extra money will also cover "perks" that are given to people who donate to the project. These include things like a copy of the movie script, Starfleet patches, and photos signed by cast members. Shooting is expected to start in November, with a tentative release date set for spring or summer 2016. Major stars in the film include Richard Hatch, Kate Vernon (both of "Battlestar: Galactica"), Gary Graham ("Star Trek: Enterprise") and Tony Todd ("Candyman", "Chuck", "24"). You can watch the trailer for the new movie here. There is also a 20-minute preview about the film, released last year, called "Prelude to Axanar," which is available to watch online. Although "Star Trek" is a CBS property, productions like "Star Trek: Axanar" can proceed as long as they do not collect a profit. To help cut costs on the prelude film, the actors agreed to collect a reduced salary, and the production staff worked without pay, Peters told Space.com in 2014. Follow Elizabeth Howell @howellspace,Follow us @Spacedotcom, Facebook and Google+. Original article on Space.com.